If you have been a follower of mine for awhile, you will certainly recognize this technique. If the look isn’t broke, why fix it, right?! We used this technique three years ago to create our outdoor dining table. It has held up wonderfully & we still love the look. 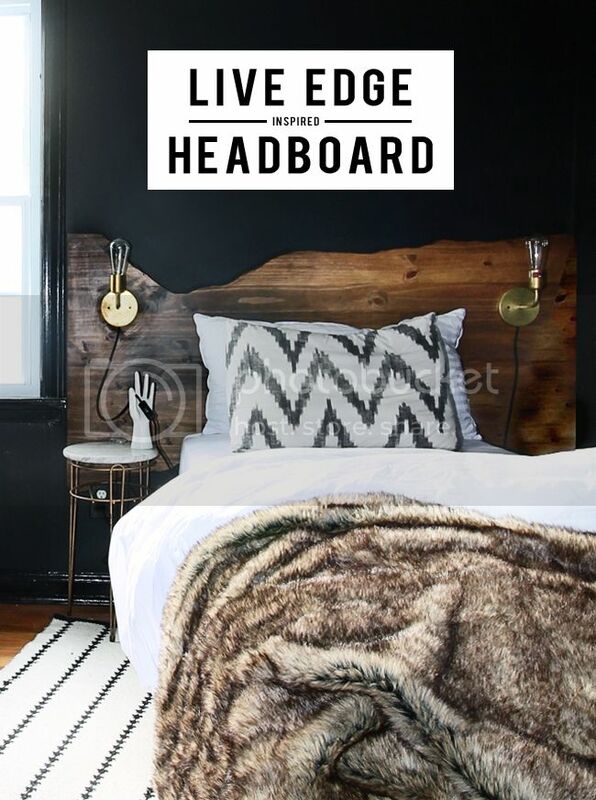 So when the time came to determine a headboard for the boy, this idea immediately came to mind. And this project really couldn’t be any easier… plus it is really hard to mess up. So if you are a power tool newbie, this is a great project to try out. Like the table project, this is not a real live edge piece… this is simply inspired by the look. It all starts with a piece of large Laminated Pine Wood that is generally in stock in the lumber section of Home Depot or any large hardware supply. Just your run of the mill squared off piece of wood. Nothing special… yet. To create your Live Edge Look, I like to start with a JigSaw to give my overall outline or shape I am looking for. This can be pretty rough as you will be going over the entire cut with your Belt Sander. So don’t stress if your cut lines look choppy or jagged. I told you this project is forgiving. Next you go over your cut lines with the Belt Sander (typically in a Medium Grit Paper first). And you literally follow your cut line sanding as much of the wood as you want. I find it works best to change the angle that the sander is in as you move along to give it a more realistic look. That’s it. Simply attack the wood & have fun. After you are satisfied with the wood, go over the entire piece with a fine sandpaper to ensure a smooth surface. When it comes to staining, I always like to use a PreStain first. This allows the actual stain to go on smoothly rather than blotchy. It’s an easy application, so why not do it right the first time. Follow the PreStain with your color of choice, I used Minwax Special Walnut. Once that is dry you will need to use a sealer. I used a Satin Polyurethane. Once you are ready to hang I highly recommend using a Pair of French Cleats (& appropriate anchors if not hanging directly on a stud) to mount this to the wall. This hanging method is one of my go go’s. Especially for headboards or large art. Knowing space was limited in our situation & that typical nightstands would not be an option, I opted for sconces mounted directly on the wood. These Raw Brass Beauties from Barn Light Electric were the exact look I was going for. And having the exposed cord left me with the option to not have them hardwired. And a really fun reason to use my porcelain hand as an accessory… not gonna lie! And speaking of nightstands… this little marble & brass table has made it’s way throughout our home & it’s one of those pieces I get asked about all the time, so I’ll explain it again. It was constructed from a brass hairpin plant stand I found at the thrift store for maybe $2.92 & an extra marble top I had from another plant stand. That’s it. I’ll be back tomorrow with more room details! I really love how this space turned out. 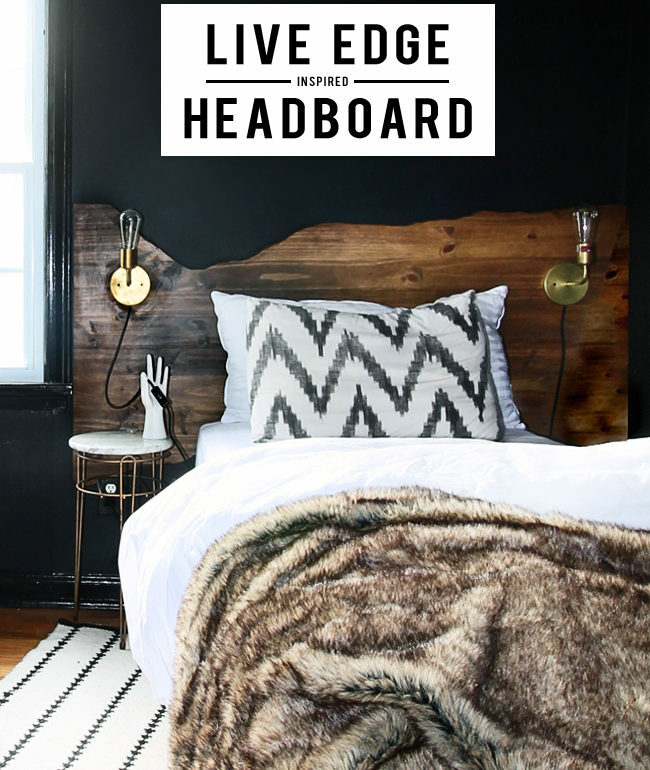 The live edge headboard is the perfect touch of earthiness and really adds to the masculine vibe. Beautiful work! So amazing! How thick was the pine board? This looks great! What a lucky guy! This turned out so well and the brass wall sconces are perfect here! 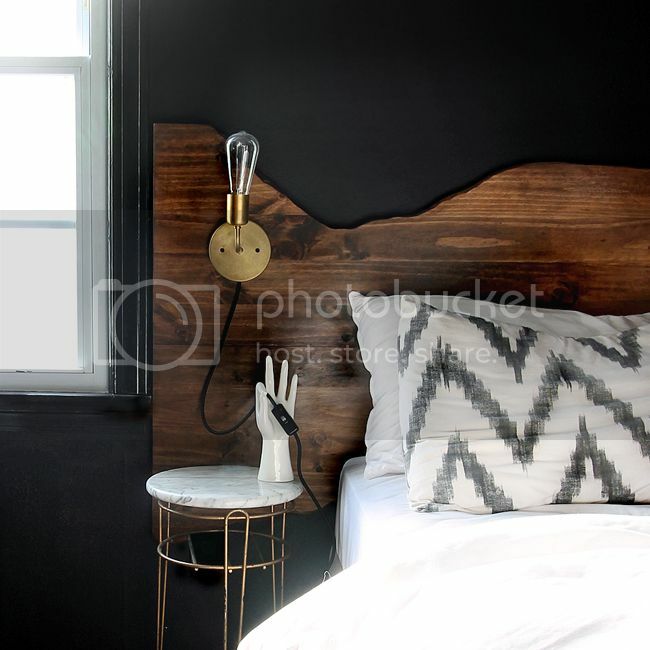 You are NAILING this room, love the headboard + sconce! always love our out-of-the-box thinking to create the prettiest designs! Oh my goodness. 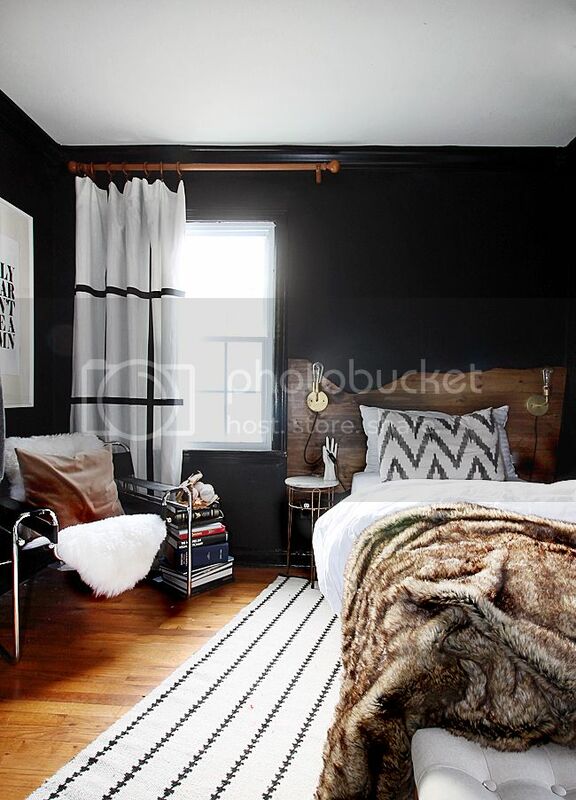 This whole room is absolute perfection. Perfection! All the patterns and textures and materials just flow so effortlessly. Ps where did you get that zig zag pillowcase?? You are KILLING me this is so amazing!!! I'm now completely envious of a teen boys bedroom. Hey there can you share the paint color on the Walls? ?? Love this room. Where are the curtains from? Thank you!! They are actually Ritva panels from Ikea with black grosgrain attached to make the grid. How did you find ribbon long enough. ?My panels are 98” ribbon only 7 feet. I buy my ribbon in 50 yard rolls usually. They are great for projects like this & then are always good for gift wrapping later. I order from Amazon, Paper Mart & Ribbon Bazaar. Ha! Nope. Just the way the sander decided to go that day.